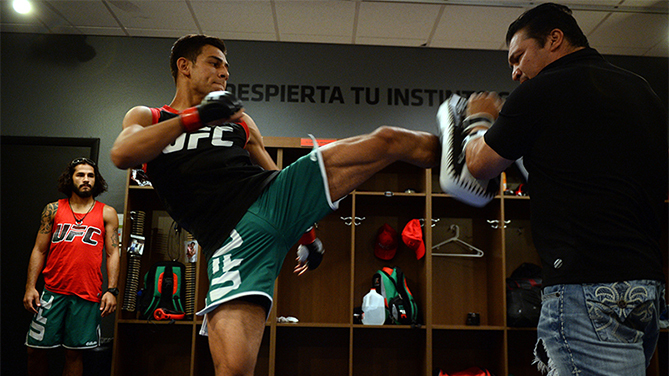 Read on to find out which featherweight moved on to the Ultimate Fighter Latin America finals! This week’s episode immediately focuses on tension gripping Team Mexico. Teammates Rodolfo and Yair will face each other, and the Team Velasquez training staff has some hard decisions to make. In order to not upset anyone, the coaching staff decides that they will not corner either fighter. They will assist with conditioning, refuse to do any strategy or planning. The entire team finds the decision to be fair, and don’t have a problem with it. Back at the house, however, everyone has a problem with the cleanliness of the house. This time around, the situation has escalated with flies and a whole host of other bugs having infested the house. Lots of fly paper and an unhealthy amount of insecticide later, the bug problems gets contained, but the core issue has not been resolved. As the great TUF bug battle draws to a close, Coach Fabricio Werdum walks in expecting everything to be ready for the team barbecue. Instead, he sees the mess and asks, “What’s going on here?” As usual, each team blames the other, and neither wants to budge. Realizing he’s not going to broker a peace any time soon, he comes up with a novel idea. In the upcoming coaches’ challenge, not only will the losing team miss out on the prize money, but they’ll also have to clean up the house for the rest of the season! Team Mexico agrees and the stakes have been raised. Cain Velasquez wins the coin toss and elects to be goalie first. Werdum winds up and hits the cross bar on his first attempt. Cain Velasquez responds with a goal and takes the early lead. The two coaches go back and forth all the way until the 12th round when Werdum makes the game winning save. Back at the house, Team Latin America rubs their win in the Mexicans’ faces and promptly dirties a few more dishes. Team Mexico lives up to the bet and dutifully clean the house. Enough with the dirty dishes, it’s fight time! Both fighters come out tentative. They measure each other up and try to gauge each other’s range. Yair attacks first, but Rodolfo answers back. He follows his inside low kick with a couple quick punches and seamlessly transitions to the takedown. He plants Yair to the mat and starts trying to break the guard. He briefly takes Yair’s back, but can’t secure the hooks. 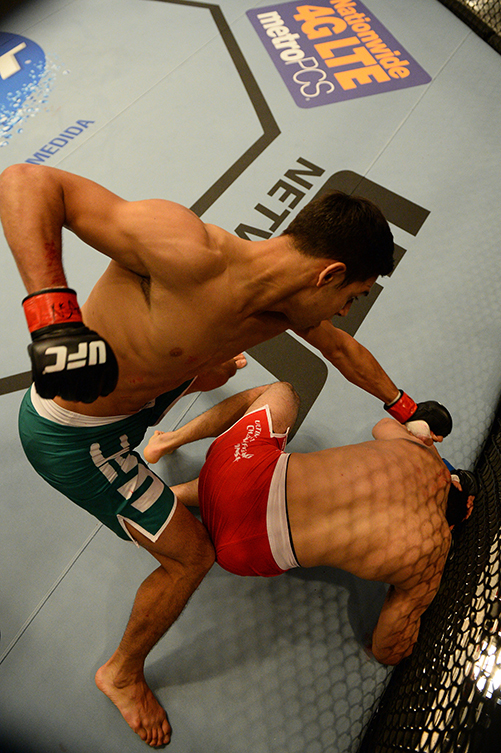 Yair rises to his feet and the fight returns to the center of the cage. The cautiousness that punctuated the early part of the round has gone out the window. Yair tries a head kick, but it’s blocked. Rodolfo counters with a low kick. Yair answers back with a spinning backfist. In the brief moment that Yair gives his back, Rodolfo jumps in for another takedown. Yair reverses and lands in top position. Working from half guard, he drops elbows and short, stiff punches. Rodolfo attempts a leg lock, but Yair easily slides out. He stands over his opponent, backs off and asks Herb Dean to stand him up. With two minutes remaining, Yair busts out a couple more flashy kicks and Rodolfo counters with a low kick and short punch combos. He pushes Yair to the fence, but backs off. Giving up this space turns out to be a costly mistake. Yair spins and strings together a brutal punch/kick combo that drops Rodolfo to the mat. He follows up with some ground and pound and Rodolfo has had enough. Yair advances to the finals via verbal submission. We quickly move into a sneak peek for next week’s episode. Will Marlon’s skin infection (and quarantine) cost him a spot in the finals? Can Guido get a chance at redemption? Does Alejandro wind up beating both of them? Find out this and more next week on The Ultimate Fighter!